A laser in Shanghai, China, has set power records yet fits on tabletops. Inside a cramped laboratory in Shanghai, China, physicist Ruxin Li and colleagues are breaking records with the most powerful pulses of light the world has ever seen. At the heart of their laser, called the Shanghai Superintense Ultrafast Laser Facility (SULF), is a single cylinder of titanium-doped sapphire about the width of a Frisbee. After kindling light in the crystal and shunting it through a system of lenses and mirrors, the SULF distills it into pulses of mind-boggling power. In 2016, it achieved an unprecedented 5.3 million billion watts, or petawatts (PW). The lights in Shanghai do not dim each time the laser fires, however. Although the pulses are extraordinarily powerful, they are also infinitesimally brief, lasting less than a trillionth of a second. The researchers are now upgrading their laser and hope to beat their own record by the end of this year with a 10-PW shot, which would pack more than 1000 times the power of all the world’s electrical grids combined. Largely missing from the fray are U.S. scientists, who have fallen behind in the race to high powers, according to a study published last month by a National Academies of Sciences, Engineering, and Medicine group that was chaired by Bucksbaum. The study calls on the Department of Energy to plan for at least one high-power laser facility, and that gives hope to researchers at the University of Rochester in New York, who are developing plans for a 75-PW laser, the Optical Parametric Amplifier Line (OPAL). It would take advantage of beamlines at OMEGA-EP, one of the country’s most powerful lasers. “The [Academies] report is encouraging,” says Jonathan Zuegel, who heads the OPAL. Invented in 1960, lasers use an external “pump,” such as a flash lamp, to excite electrons within the atoms of a lasing material—usually a gas, crystal, or semiconductor. When one of these excited electrons falls back to its original state it emits a photon, which in turn stimulates another electron to emit a photon, and so on. 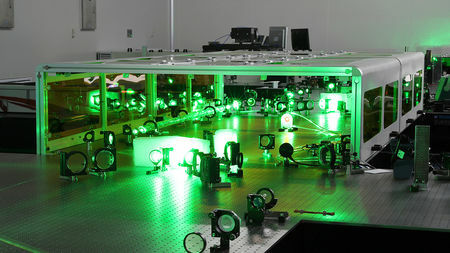 Unlike the spreading beams of a flashlight, the photons in a laser emerge in a tightly packed stream at specific wavelengths. Because power equals energy divided by time, there are basically two ways to maximize it: Either boost the energy of your laser, or shorten the duration of its pulses. In the 1970s, researchers at Lawrence Livermore National Laboratory (LLNL) in California focused on the former, boosting laser energy by routing beams through additional lasing crystals made of glass doped with neodymium. Beams above a certain intensity, however, can damage the amplifiers. To avoid this, LLNL had to make the amplifiers ever larger, many tens of centimeters in diameter. But in 1983, Gerard Mourou, now at the École Polytechnique near Paris, and his colleagues made a breakthrough. He realized that a short laser pulse could be stretched in time—thereby making it less intense—by a diffraction grating that spreads the pulse into its component colors. After being safely amplified to higher energies, the light could be recompressed with a second grating. The end result: a more powerful pulse and an intact amplifier.